I came across this recipe about two years ago, and it has been a camping favorite ever since! 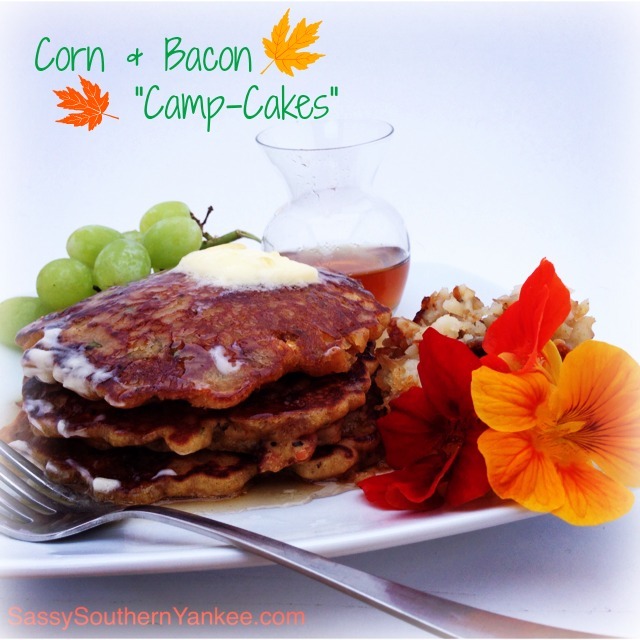 These Corn and Bacon Camp-Cakes are the perfect balance of sweet, and savory and lets face it they have bacon. Who doesn’t love bacon? It’s funny how other fellow campers come drifting to my site when these camp-cakes are on the griddle, make extra because your sure to have a few extra guest for breakfast. For those of you who love to camp, but hate the clean up and mess of making a full breakfast have no fear. I make everything ahead of time and pour it into a zip lock, or a container with a lid and a pour spout (an empty 1/2 gallon jug works perfect). The batter will keep in the refrigerator for about 3-4 days just be sure to shake it to mix it up before using. In a skillet cook all of the bacon until nice and crispy. I LOVE crispy bacon! 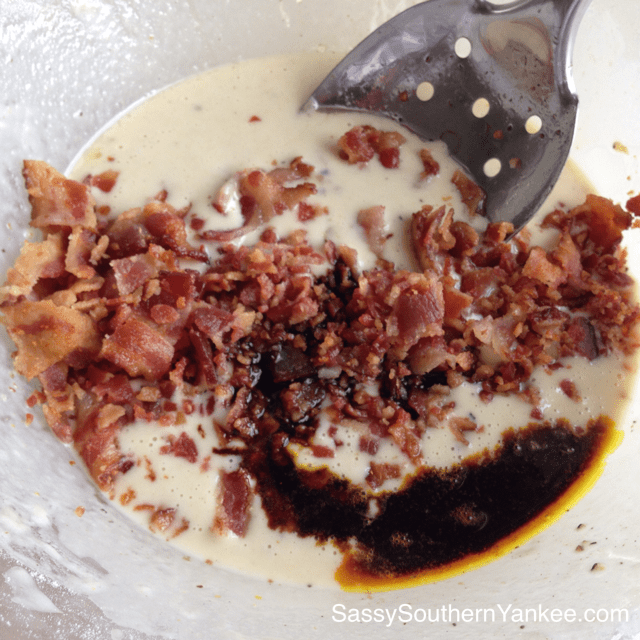 If you’re not a fan you can cook the bacon until your desired crispiness, but it’s easiest if it crumbles. Remove the bacon from the pan and drain on a plate lined with paper towel. Using the same pan you just cooked in bacon in add the onions. We will use the bacon drippings to sauté the onions and add another layer of flavor. Cook onions until translucent. Add the corn to the onions and continue to cook until thawed. If you’re using fresh corn you can skip this step. In a large bowl start the “pancake” part. Add the eggs, milk, vanilla, baking powder and chili powder whisk until the eggs are beaten. 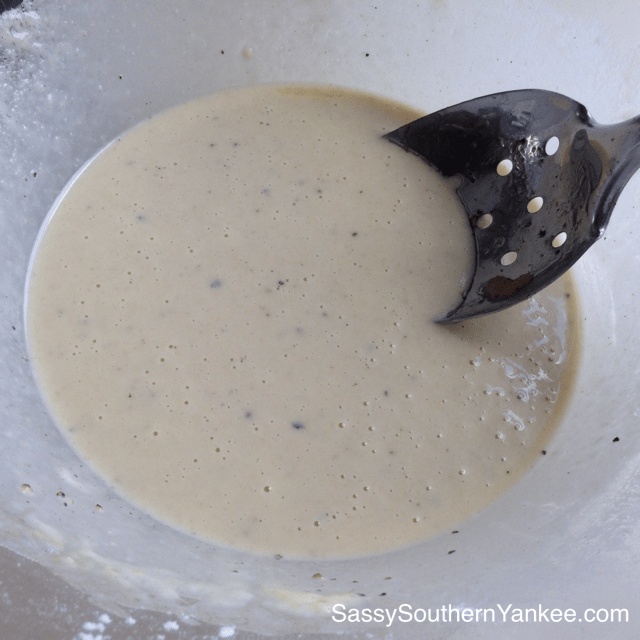 Slowly beat in the flour or pancake mix (whichever one you have works). Take half of the bacon and crumble it then toss it in the pancake mix, add the onion, corn and chives. Stir until everything is combined. The mixture will be thick and lumpy don’t worry! Heat a skillet or griddle and then spray with non-stick spray. 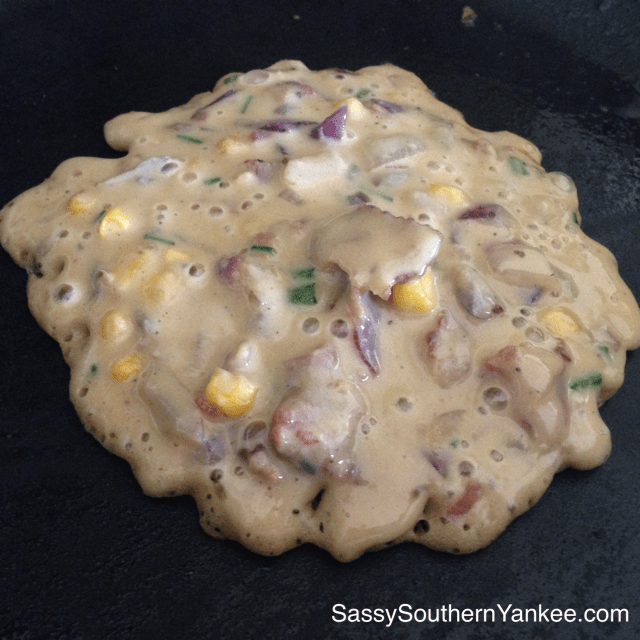 Pour the batter onto the hot skillet about 1/3 Cup at a time, cook for about 2 min on each side or until done. A great way to tell if its time to flip the pancakes is when all of the air bubbles pop to the top. Look at all those bubbles! Top the Camp-Cakes with the remaining bacon and puddles of real maple syrup. Now enjoy Every. Last. Bite! 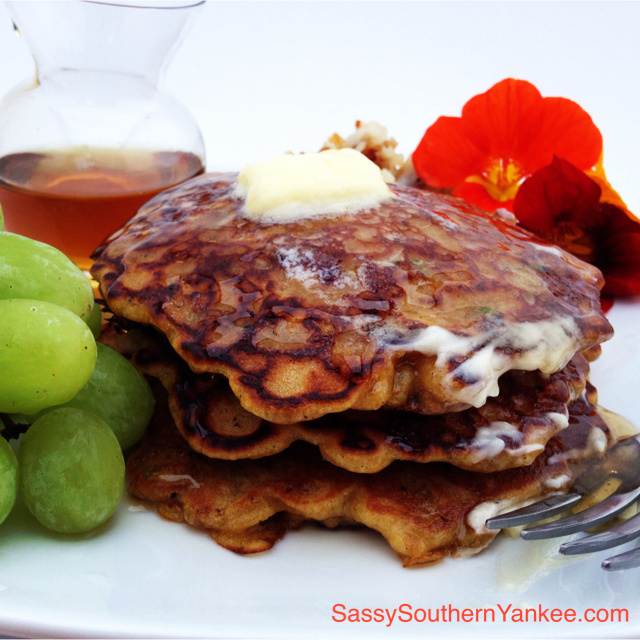 These Camp-Cakes are the perfect balance of sweet, and savory and lets face it they have bacon. Who doesn't love bacon? It's funny how other fellow campers come drifting to my site when these camp-cakes are on the griddle, make extra because your sure to have a few extra guest for breakfast. In a skillet cook all of the bacon until nice and crispy. I LOVE crispy bacon! If you're not a fan you can cook the bacon until your desired crispiness, but it's easiest if it crumbles. Remove the bacon from the pan and drain on a plate lined with paper towel. Using the same pan you just cooked in bacon in add the onions. We will use the bacon drippings to sauté the onions and add another layer of flavor. Cook onions until translucent. 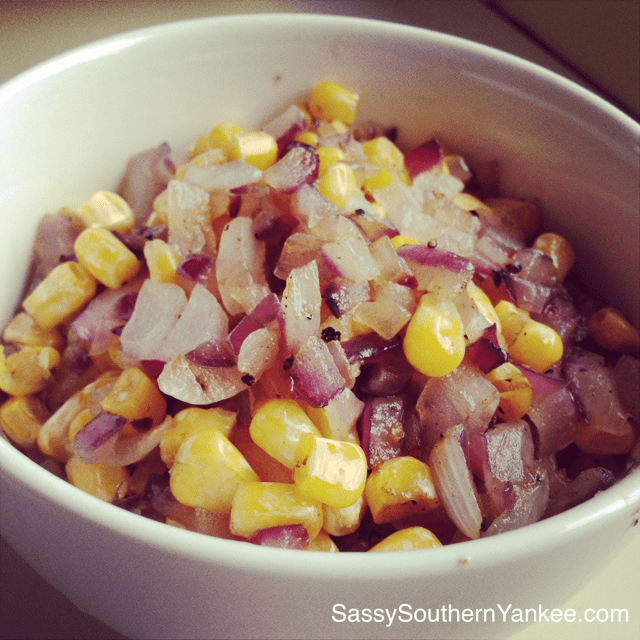 Add the corn to the onions and continue to cook until thawed. If you're using fresh corn you can skip this step. In a large bowl start the "pancake" part. Add the eggs, milk, vanilla, baking powder and chili powder whisk until the eggs are beaten. Slowly beat in the flour or pancake mix (whichever one you have works). Take half of the bacon and crumble it then toss it in the pancake mix, add the onion, corn and chives. Stir until everything is combined. The mixture will be thick and lumpy don't worry! Heat a skillet or griddle and then spray with non-stick spray. Pour the batter onto the hot skillet about ⅓ Cup at a time, cook for about 2 min on each side or until done. A great way to tell if its time to flip the pancakes is when all of the air bubbles pop to the top. 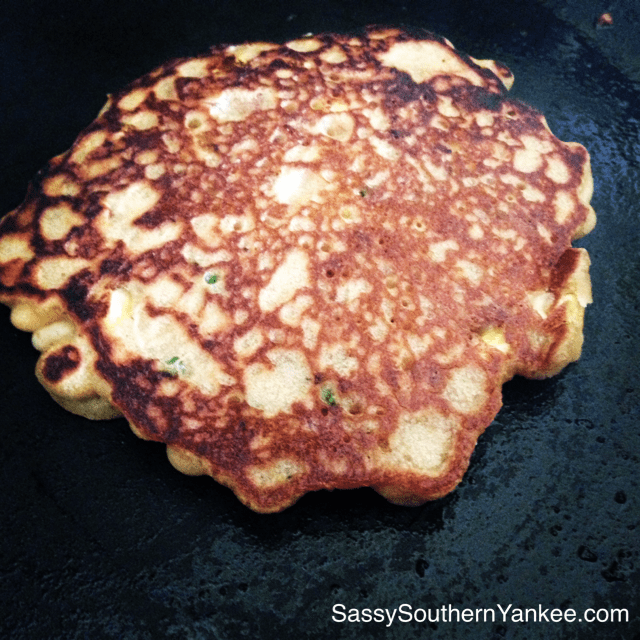 This entry was posted in Breakfast and tagged 30 Min Meals, Bacon, Breakfast, Brunch, Camping, Chives, corn, Corn and Bacon Campcakes, Corn Cakes, Gluten Free, Hot Cakes, Maple Syrup, Onion, Open Fire Cooking, Pancakes, The perfect Camping Breakfast.